CORS Scout 12.5"x8.5" DD Search Coil for Minelab Sovereign & Excalibur Detector. Carry Bags, Pouches & Covers. This waterproof coil has excellent maneuverability and sensitivity to large, medium and small targets. The coil is especially suited to search land heavily littered with iron, such as cities, beaches and parks. The Scout coil is unusually light for its size, which makes it easy to search for a whole day. Compatible with the Minelab Sovereign Metal Detector. The Search Coil used by Professionals and Serious Detectorists! The CORS Scout Search Coil has excellent maneuverability and sensitivity to large, medium and small targets. This coil is unusually light for its size, which makes it easy to search for a whole day. The coil is superior to a standard coil in depth by 5%-30% (depending on the model of the metal detector) and in ground coverage of between 25%-50% (depending on the model of the metal detector). 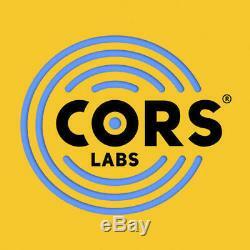 The CORS Scout Search Coil is recommended as a replacement for standard coils. The coil is fully submersible, the coil body is filled with high quality epoxy resin. Regular shaft only, not compatible with Minelab Sovereign hipmount kit. Coil Size: 12.5" x 8.5" (31.7 x 22 cm). Weight: 17.2oz (490g) (without coil cover). The Coil is filled with a high quality epoxy resin. Extremely robust coil mounting bracket. Cable Strain relief offers complete waterproofing. Outer Coil shell manufactured from high impact resistant plastic UV Protected. The Search Coil is completely Waterproof. Coil cover is included (you can use it without a coil cover as well). Connector has gold or silver plated contacts depending on the model. High-strength cable with a larger cross-section - Made in Germany. Coil Skidplate already attached to coil. Listings for USED Items / Auctions. You have nothing to lose! 3901 Bestech Road #100 Ypsilanti, MI 48197. Opening hours: Monday through Friday 8:30AM 5:00PM. Our reason for being is to help You find the Best Metal Detectors and Accessories that fit Your specific needs. It's simple, we say NO to junk and make your Metal Detecting Experience GREAT. 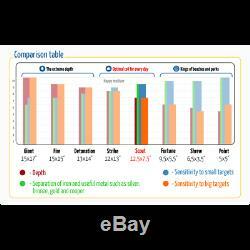 With Serious Detecting you know you will get high quality products and service without compromises. The item "CORS Scout 12.5x8.5 DD Search Coil for Minelab Sovereign & Excalibur Detector" is in sale since Monday, January 8, 2018. 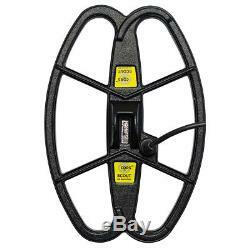 This item is in the category "Business & Industrial\Test, Measurement & Inspection\Test Meters & Detectors\Metal Detector Accessories". The seller is "serious_detecting" and is located in Ypsilanti, Michigan. This item can be shipped to United States, Canada, United Kingdom, Denmark, Romania, Slovakia, Czech republic, Finland, Hungary, Malta, Australia, Greece, Portugal, Cyprus, Slovenia, Japan, Sweden, South Korea, Indonesia, Taiwan, South africa, Belgium, France, Hong Kong, Ireland, Netherlands, Poland, Spain, Italy, Germany, Austria, Bahamas, Israel, Mexico, New Zealand, Philippines, Singapore, Switzerland, Norway, Saudi arabia, United arab emirates, Qatar, Kuwait, Malaysia, Chile, Colombia, Costa rica, Dominican republic, Panama, Trinidad and tobago, Guatemala, El salvador, Honduras, Jamaica, Uruguay, Bulgaria, Latvia, Lithuania, Estonia, China, Thailand, Ukraine, Bahrain, Croatia, Barbados, Bolivia, Ecuador, Guadeloupe, Jordan, Cayman islands, Peru, Paraguay, Reunion, Viet nam.